Many of us appreciate a nice, big, juicy burger. And thankfully, when cutting back on foods high in fat and cholesterol, here’s one version of this delicious dish that you won’t have to give up. 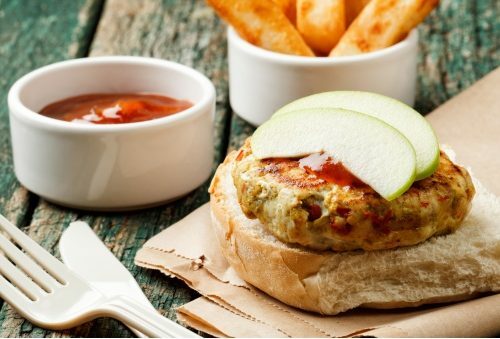 This satisfying turkey burger is filled with delicious, complimentary flavors. Barbecue lovers will not be disappointed – it comes out juicy every time. Preheat your grill or griddle to about 425ºF. In a large mixing bowl, combine all of your ingredients. Use your lovely fingers to mix everything together really well until the turkey has combined properly with all of the ingredients. The roasted red pepper and marmalade are a winning flavor combination. Feel free to use store-bought roasted peppers and chop them finely. Once all your ingredients are combined nicely, form them into patties that fit in the palm of your hand. Toss them on the grill and cook for about 5 minutes per side, turning once, until an internal temperature of 180ºF has been reached. Serve them up any way you like and enjoy!